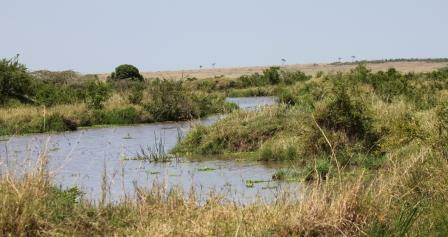 The Masai Mara National Reserve is administered by the local country councils. 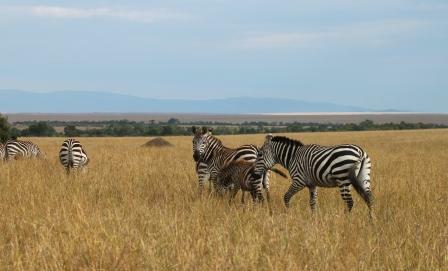 It is probably the most famous and most visited game reserve in Kenya. It offers breathtaking views (as seen in the film Out of Africa, much of which was filmed here) an extraordinary density of animals including the "Big Five" and many varieties of plains game. The Masai Mara not only covers the Masai Mara National Reserve area, but also extensive game dispersal areas on the adjacent land. An impressive feature is the annual migration of wildebeest, zebra and gazelle from the plains of the Serengeti that cross the Tanzania border and rivers to reach the Mara's grasslands from late June, tracked by predators: lion, leopard, cheetah, hyena and circled by vultures as the journey unfolds. Their dramatic river crossings are a main attraction for tourists visiting in early July-August. The climate is gentle, rarely too hot and well-spread rainfall year round. 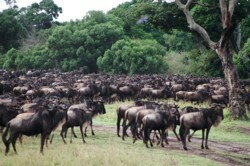 Between July and October, when the great wildebeest migration is in the Mara the sensation is unparalleled. After exhausting the grazing in Tanzania's northern Serengeti, a large number wildebeest and zebra enter the Mara around the end of June drawn by the sweet grass raised by the long rains of April and May. It is estimated that more than half a wildebeest enter the Mara and are joined by another 100,000 from the Loita Hills east of the Mara. Driving in the midst of these great herds is an unimaginable experience. Apart from the seasonal migration, game viewing is excellent year round. 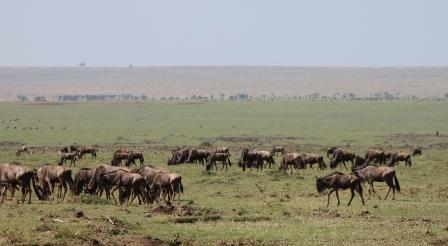 The Mara is home to the richest concentration of wildlife. The Maasai live within the dispersal area with their stock but centuries of close association with the wildlife have resulted in an almost symbiotic relationship where wildlife and people live in peace with one another. The first sight of this park is breathtaking. Game includes: elephant, black rhino, buffalo, plains zebra, hartebeest and the big cats; the rivers are home to hippos and crocodiles, 452 species, 53 of which are raptors.